To set up Wireless Security on your Linksys ADSL Gateway, follow the steps below. Launch a browser and enter 192.168.1.1 in the Address bar to access the ADSL gateway’s web-based setup page. For instructions, click here. NOTE: If you're using a Mac®, click here for instructions. The default Username and Password is admin. On the ADSL gateway's web-based setup page, click Wireless then click Wireless Security. NOTE: If you are using a Linksys X3500 or X6200 Gateway, the Wireless tab doesn’t have a Wireless Security sub-tab. Instead, you will need to click the Manual radio button under Basic Wireless Settings to display the 5 GHz and 2.4 GHz wireless security settings. Click the drop-down arrow for Security Mode and select the type of security. Enter your desired Security Key on the Passphrase field. This will serve as your network key whenever you connect to your wireless network. NOTE: Keep the passphrase confidential. This case-sensitive key will secure your wireless network. NOTE: The Encryption for WPA Personal is TKIP, while the Encryption for WPA2 Personal is AES. It is recommended to use WPA2 Personal as it gives higher security and optimum performance for your wireless network. RADIUS Server - Enter the RADIUS server's IP address. RADIUS Port - Enter the port number used by the RADIUS server. The default is 1812. Shared Key - Enter the key used by the device and Radius server. Encryption - Select a level of WEP encryption, 40 / 64-bit (10 hex digits) or 104 / 128-bit (26 hex digits). Passphrase - If you want to generate WEP keys using a Passphrase, then enter the Passphrase in the field provided and click the Generate. Key 1 - If you want to manually enter a WEP key, then complete the field provided. A WEP key can consist of the letters "A" through "F" and the number "0" through "9". It should be 10 characters in length for 40/64-bit encryption or 26 characters in length for 104/128-bit encryption. Wireless access can be filtered using the Media Access Control (MAC) addresses of the wireless devices transmitting within your network's radius. You can either permit or prevent specific wireless computers access to your wireless network. To learn how to permit wireless computers to connect to your wireless network with MAC filtering, click here. To learn how to prevent wireless computers to connect to your wireless network with MAC filtering, click here. This procedure will prevent other users from detecting your SSID or your wireless network name, when they attempt to view available wireless networks in your area. NOTE: Relying on a hidden SSID is not recommended since there are applications developed nowadays that would detect hidden networks. 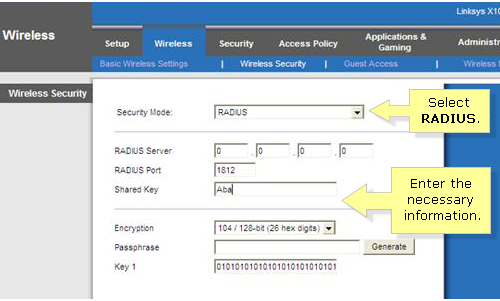 To make sure your network is secured, set your wireless security mode to WEP, WPA, WPA2 or RADIUS. When the ADSL gateway’s web-based setup page appears, click Wireless. Look for SSID Broadcast and select Disabled.